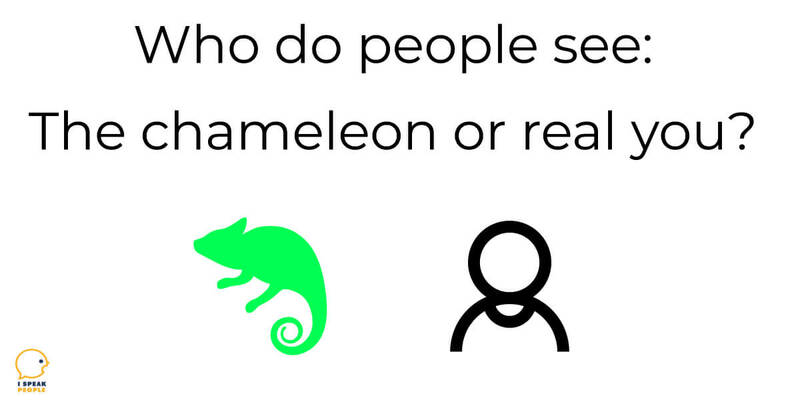 Who do people see: The chameleon or real you? I have two sides: the chameleon and the real me. When I’m first getting to know someone, I reflect back to him or her what I think he or she wants to see. I adapt to his or her conversation style and interests, holding back my true thoughts and opinions, much like a chameleon blends in with a tree branch. This goes on until I’m sure a person is safe and I decide I want to take the relationship deeper. As a result, many people never get to know my true thoughts and feelings. They see only a shadow of the real me. I blend in to preserve harmony, minimize conflict, and protect my thin skin. Many INFJs I’ve met do life this way. Is this a bad thing? Why do we act this way, and what can we learn from our behavior? Is it bad to hide the real you? I just had a great conversation with Hannah Braime of BecomingWhoYouAre.net. She told me that learning it was okay to have a few deeper relationships and a wide circle of acquaintances was freeing. Hannah discovered this was the way most INFJs operate after reading a personality type description. She no longer felt like she had to be the extrovert the world was telling her to be. If you’re concealing the real you from acquaintances, I don’t see anything wrong with that, so long as you’re not contradicting your core beliefs. Not everyone needs to know the deepest, most important parts of your life. In fact, it’s wise to avoid throwing your pearls to swine or, in other words, laying out delicate parts of the real you for others to trample on. To some extent, trust needs to be earned. But there’s another part of us that would benefit from sharing our ideas more directly. One of the best ways for us to grow is to share our true thoughts and feelings, after spending some time parsing them out. Why do we try to blend in? Why don’t we just come out and say what we think anyhow? One reason is that we’re introverts with limited energy. While, at times, we show up as very outgoing extroverts – at least some of us, depending on what kind of INFJs we are – we all need to rest and recharge. Furthermore, we desire and crave depth in relationships, so we typically reserve our best for trusted friends and family members. Additionally, when you combine introverted intuition (Ni) and extroverted feeling (Fe) – the first two cognitive functions, or mindsets in the INFJ personality – you get a person who’s particularly sensitive to what other people say and think about him or her. INFJs have notoriously thin skin, and we can quickly detect when someone disapproves, even if he or she doesn’t come right out and say it. So we intentionally steer clear of hurtful words and keep the peace. It’s only when people deeply frustrate us, we’re stressed, or we feel strongly about an issue that we voice our true thoughts and feelings. And when we do, our logic comes out cloaked in emotion. Sadly, our intensity tends to rub other people the wrong way, and they may avoid us in the future. First off, don’t beat yourself if you’re a bit of a chameleon and don’t reveal the real you to everyone. You’re normal as far as INFJs go. And, as we’ve seen, it’s not all bad to protect the more sensitive part of you. You can, however, grow by challenging yourself to share what you really think more often. Aim for gradual growth, and start by sharing in the context of safe relationships. You may also want to start a blog where you share what you’re learning with a few close friends and family members. If you want a more private outlet, keep a journal or running document on your computer. Writing out your thoughts and feelings will help you determine what you really think and communicate ideas more clearly and succinctly. My ISTJ wife has been a big encouragement to me. She’s great at speaking her mind and often has a hard time understanding why I don’t more readily voice what I think. With her encouragement, I’m learning to share more freely. There’s a lot we can learn from close friends and family members who think differently than us too. Ultimately, give yourself time, and keep learning. INFJs tend to take a long time to grow, develop, and figure out who we really are. We do a lot of investigating and big-picture research to better understand how the world works and how we fit into it. Do you tend to be more of a chameleon or more frequently share the real you?